This is something that scares most apple tree owner. People often say to me that they don’t prune them because they don’t know what they’re doing, or I quite often see them pruned in the wrong way. The worst thing you can do to an apple tree, in my opinion, is not to prune it. Cutting stimulates growth, you get to shape it into a form that works for you and control it’s growth and fruiting potential. Winter tree pruning can be any time from when the leaves have fallen until the sap starts to rise and the buds start to swell. I try to do mine before Christmas if I can but have been as late as March before now. Before starting to prune your tree, step back and have a good look around it. See how it grows and the height it is. Walk around it and see it from every angle. Now don’t fear the saw. 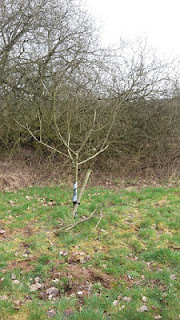 I use a folding pruning saw and a pair of secateurs for all my pruning on my young trees, on mature trees I might use a chainsaw. If you’re not competent with a chainsaw make sure you get someone who is to do that work. It’s far harder cutting in a tree than logging firewood. I’m lucky as my brother is a qualified arborist and has taught me well. The Dutch, who are masters at pruning and producing fruit, say that we are good at growing more wood not fruit! Mature tree afterrwards - hhandy to have two poepel on one like this, very hard to tell when you're in the tree! As I hand pick the fruit from my trees I want them to grow at my height and no higher than I can reach. 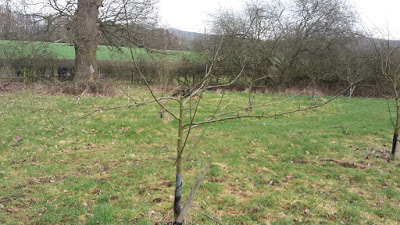 I’m not planning on grazing my orchards when they get bigger and because of this I grow all of my trees on MM106 stocks (more on this in another post). 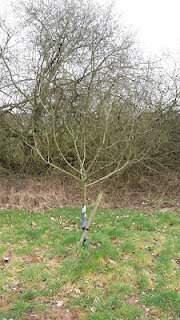 After - not much to take off this young tree but it should help it to bush out and give more options of branches to choose to grow on. The shape of the tree I’m looking for is a polo tree – one with a hole in the middle. It’s said you should be able to chuck your hat through and it not catch on any branches! Getting towards the right tree shape. Could do with another large branch heading towards the camera and away from it. They will come in time. This creates plenty of light and air flow, keeping the tree healthier, reducing diseases as well as letting in more light to ripen the fruit. Before you start cutting down branches have a look and see how much fruiting buds it has. This will give you an idea of its fruiting potential (frost and many other factors coming into play of course!). The buds are easy to tell apart, the ones growing close the branches are for leaf and the fatter ones are for flowers (and hopefully fruit). So make sure you don’t remove all your fruiting material! Also as you get more experienced be mindful if it is a tip or a spur bearer (again more in another post on that!). First go round and remove any damaged or diseased material, looking for woolly aphid and canker, cut this material out, always cutting back to just above a bud where possible. Look at the whole shape, make sure it’s even, look to the middle and see what’s there. If there’s a strong leader in the middle cut this out. Then look at the upwards growth, this will be growing the strongest, so cut some of this out or back to height that suits you. Any growth that is touching or covering each other is not ideal and needs to go as well. Remember not to cut too much any one year, I’d never go more than a third of small tree in one go. To do so encourages wood growth. Pruning can look brutal but the tree soon comes back! After - this tree still needs lots of work but it can be done over many years. The key shape is a goblet, but remember you’re not trying to get his shape in one year, it can takes years to get the right shape. Also remember that if you make a mistake new branches will grow and replace them. I’ve taken a tree right back to a tall stump before now and started again! Key thing is to remember that there’s no rush. Trees are pretty forgiving, new growth will come! Also a key thing is not to prune below the graft(the scar about 6 inches up)! Not an issue with modern trees which are grafted low down, but some older trees were grafted at head height so if there is vigorous growth low down then this can be the root stock overtaking the fruiting wood. I wrote this for a Facebook group but decided to share it here as well. I know there are hundreds of methods of pruning but this is what I tend to do. 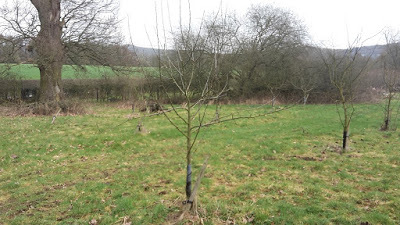 I also summer prune my trained trees each year - but that's for another post! In SE England the apple & pear trees now hold on to their leaves well into early spring because of the generally mild weather (they used to be completely bare by November). This means they are often opening with blossom before all the old leaves drop. So we have to prune while there is still some leaf on the tree (so we don't accidentally knock off all the blossom we want to keep), which makes seeing the branch shape really tricky. Useful guide Kev. I agree that, particularly with mature trees, it might take several years to get them into shape, especially if they've been neglected.